I’ve become fascinated with the story of Tnorala. 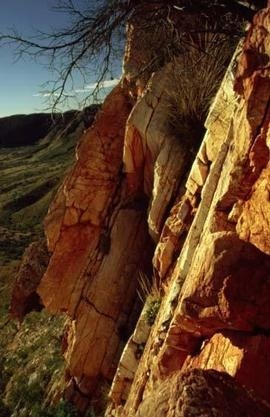 Tnorala is also known as Gosses Bluff. I wrote about it in my blog post “West from Alice”. It was formed by the impact of a celestial body falling to earth some 145 million years ago. It is thought to have been a comet. The remains of the crater can still be seen rising from the flat plains to the west of Alice Springs. Inside the crater, the climate and red sandy soil create a habitat for plants, animals and bird life that is completely different from the surrounding plains. The story of Tnorala as told by the Western Arrernte people is remarkably similar to the scientific explanation. They say that Tnorala was formed in creation time by the women of the Milky Way. The star women were dancing through the sky and one accidentally knocked over the turna, or cradle, containing her baby. The baby fell to earth with the turna tumbling after it. The turna formed the crater like shape at Tnorala and the baby was never found. The morning and evening star are the parents who appear every day to look for the baby. Scientific evidence suggests that the impact of the comet or meteorite falling to earth would originally have created a crater 22 km wide. This outer crater can now only be seen from space as it has all but eroded away. The 5 km crater remaining is what is left of what is known as the central uplift site where the comet hit. The impact would have huge, many times greater than the atomic bomb that was dropped on Hiroshima. Apparently this is not the only impact site in Australia that has a similar aboriginal dreaming story attached to it. This entry was posted in Going home and tagged Australia, Tnorala, Travel on 11/06/2014 by Deb McSephney.